This is a love story, and the protagonists are a couple of young people who met while resisting against the evil order. The antagonist? The Mayor. Sounds like Robin Hood? No, this is a newer, modern version of that, and for those of you who think this is solely a love story, well, it is certainly more than that..
Nuray and Ozgur met in the literal trenches of the post-apocalyptic Gezi Park, tending to the wounded after the riot police made repeated attacks on the civilians with gas, sound bombs and pepper-spray-mixed water from their riot vehicles. They stood together, they fought together, they resisted together, and then they fell in love. Noone knows who proposed to whom, but we all found out about their plan to get married when Ozgur showed up the night before their wedding at one of the largest public forums in a public park, and invited everyone. 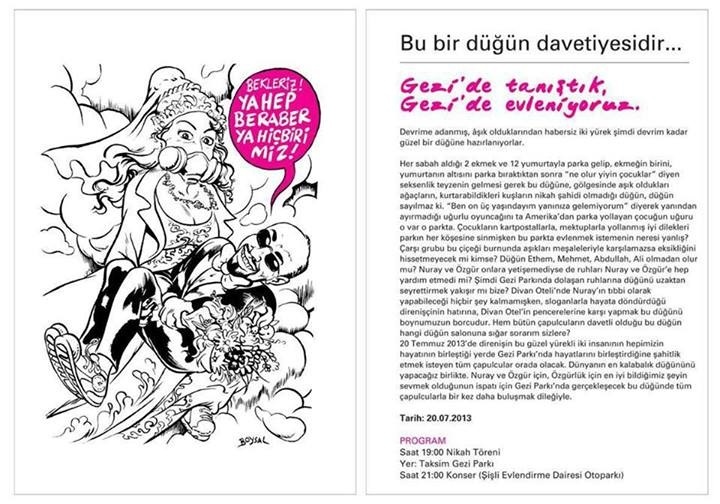 The venue would be the place where it all started: Gezi Park. The invitation which circulated on twitter, calling everyone to the happy event. All we had to do was: attend. Even the sycamores were ready, finally after all the violence, anger, pain and loss there would be a happy event! 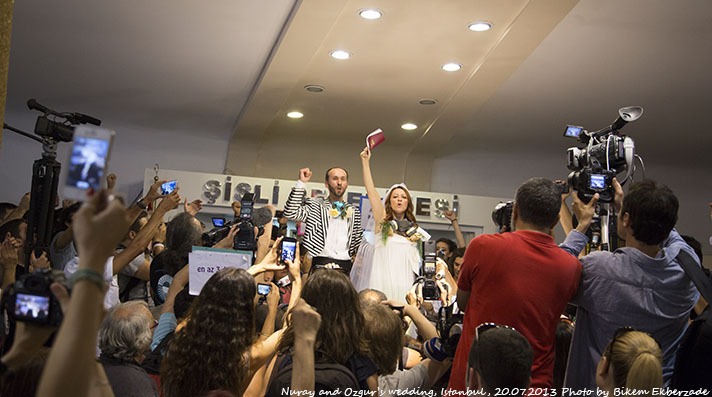 To expect an uneventful Gezi wedding would be naive of us, we were aware of that. But to hope is nothing but human. Right before I arrived at the park, a tweet fell in my timeline announcing the closing of the park on orders from the Mayor. Soon, as I landed on the marble side steps, the news was confirmed. The Mayor, not only had closed off the park once again, he had heavily policed it. With no chance of entry I headed down to the wedding hall down the street, where, once married, the couple had announced would be a small concert. 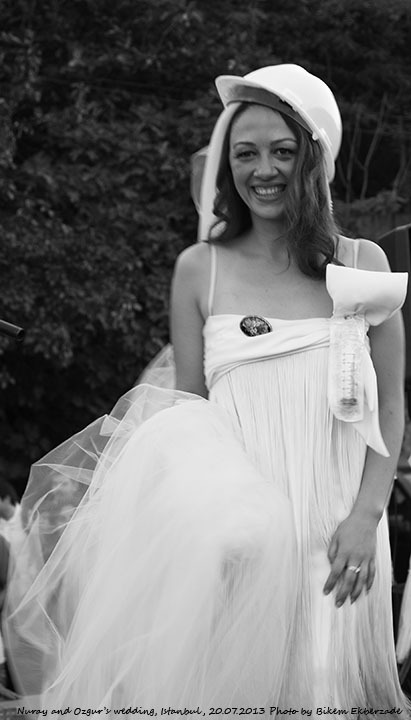 It seemed everyone else had thought the same, except, the bride was one step ahead of us. The courageous bride, in her wedding gear. At the park, where it all started, with hundreds of others. The reception, Gezi style: iftar, on newspapers, in the parking lot. More happy moments to come?